The Jeep design team gave the legendary seven-slot grille an updated look that now shows both of the outer grille slats intersecting with the headlights, paying homage to the Jeep CJ. 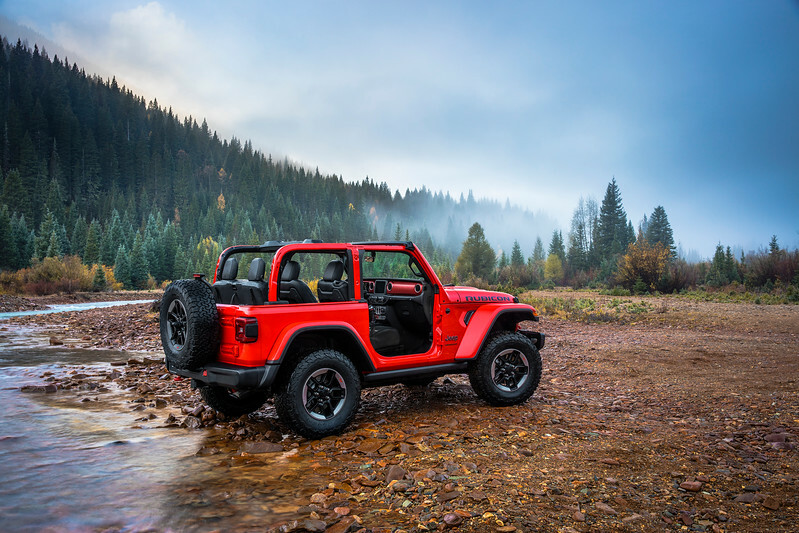 The Wrangler’s new exterior design is bold and rugged with a wide stance, and has a lowered beltline with larger windows for better outward visibility. The iconic round headlights and square taillights give the Wrangler its distinctive character, and a convenient fold-down windshield keeps the off-road purists happy. The 2018 Jeep Wrangler 2-door model is available in three different trim configurations: Sport, Sport S, and Rubicon; and the Wrangler 4-door models are available in four different trim configurations: Sport, Sport S, Sahara, and Rubicon. On the Sahara and Rubicon models, available LED headlamps and fog lamps offer pure white lighting and add to the Wrangler’s distinctive look. 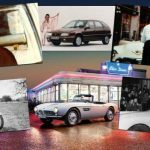 These models feature daytime running lights that now form a halo around the perimeter of the headlights and standard LED forward turn signals are positioned on the front of the wheel flares. From behind, traditional square tail lamps feature available LED lighting. All models feature lightweight, high-strength aluminum doors, hinges, hood, fenders, and windshield frame, along with a magnesium swing gate to reduce weight and boost fuel economy. The new bodies ride on suspension systems tuned to optimize on-road handling and ride comfort without sacrificing off-road capability. Wrangler Rubicon models offer improved articulation and total suspension travel versus the previous generation, with help from an electronic sway-bar disconnect. 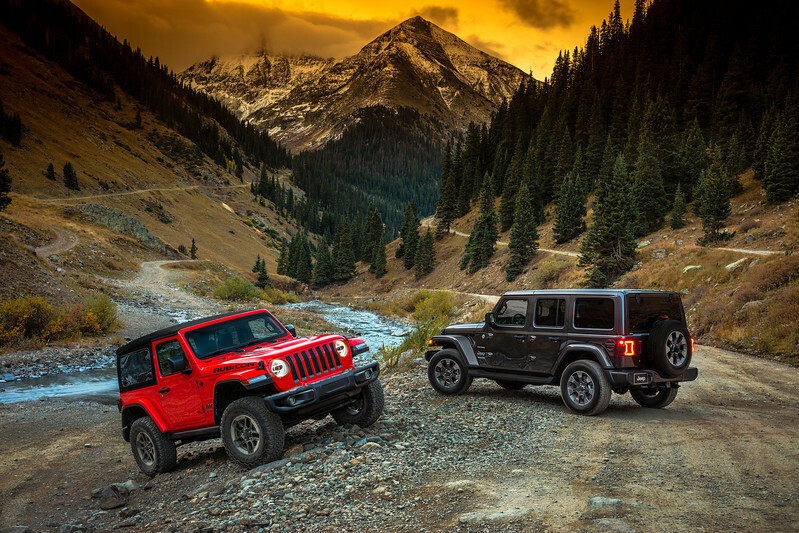 With the standard six-speed manual transmission, Wrangler Rubicon has an impressive and improved crawl ratio of 84.2:1, and 77.2:1 on Rubicon models equipped with the new eight-speed automatic transmission – which makes scaling any obstacle on the trail easy. An all-new 2.0 liter, double overhead cam, turbocharged inline four-cylinder engine joins the Wrangler team for 2018, and the faithful 3.6 liter Pentastar V6 has been upgraded. The turbocharged inline four-cylinder engine with eTorque technology is rated at a best-in-class 270 horsepower and 295 lb.-ft. of torque, and is mated to a new eight-speed automatic transmission. The eTorque system’s hybrid functions include auto stop/start, electric power assist, extended fuel shut-off, transmission shift management, intelligent battery charging and regenerative braking. Both the engine and fuel flow may be turned off during stops, coasting, or when the engine is decelerating. The 2.0-liter turbocharged I-4 engine features dual independent camshaft timing, and a cooled exhaust gas recirculation system. 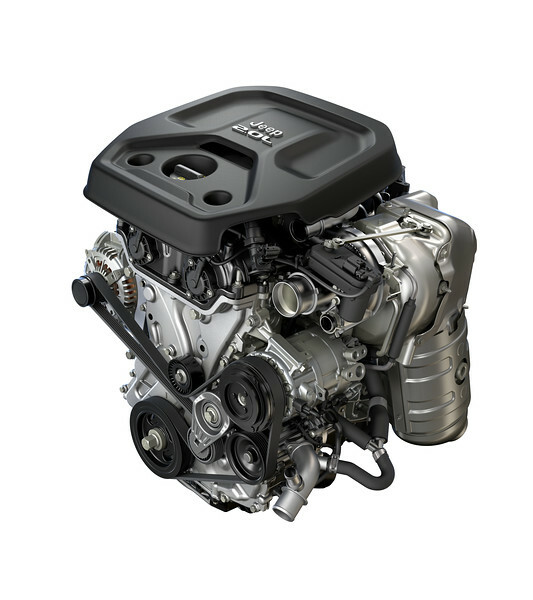 The 3.6 liter Pentastar V6 engine delivers 285 horsepower and 260 lb.-ft. of torque, and now features Engine Stop-Start as standard equipment. Known for its refinement, power, efficiency, and adaptability, there are more than five million 3.6-liter V6 Pentastar engines on the road today. The 2018 Jeep Wrangler benefits from the popular V6 engine’s low-range torque. 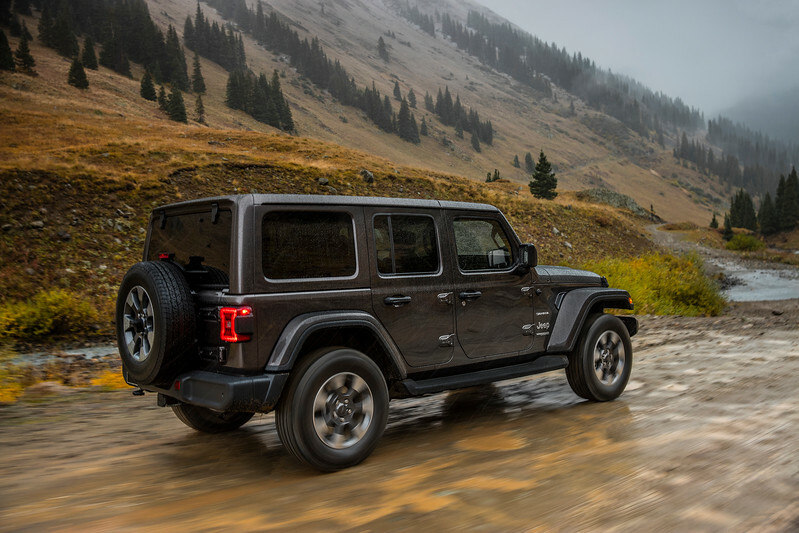 An all-new six-speed manual transmission is standard on all Wrangler models equipped with the 3.6-liter Pentastar V6, and a new-to-Wrangler eight-speed automatic transmission is optional. The new eight-speed automatic transmission enables the vehicle to optimize engine output while on the trails, or offer smooth, efficient power delivery at highway speeds. All 2018 Jeep Wrangler models are equipped with the new standard six-speed manual transmission, which features a unique design employing new gear ratios for improved crawl ratio performance, a new gear pattern, and a cable-operated design, which eliminates shifter vibration and improves sound isolation. The revised shift pattern features improved shift accuracy, a more comfortable shifting position, and 50 percent shorter shifter throws than that of the outgoing Wrangler models. 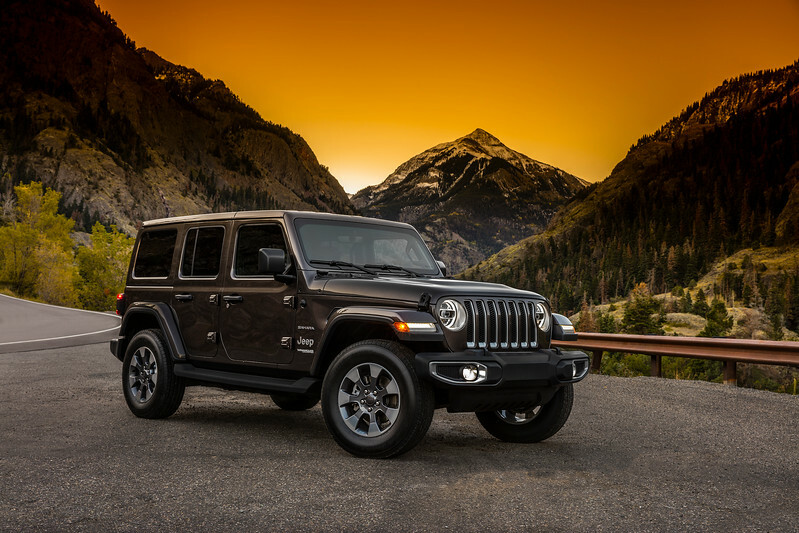 The Jeep Wrangler remains the only true open-air 4×4 SUV on the market and the new, easy-to-use Sky One-Touch power top, two hardtops, and a premium soft top offers more open-air freedom. 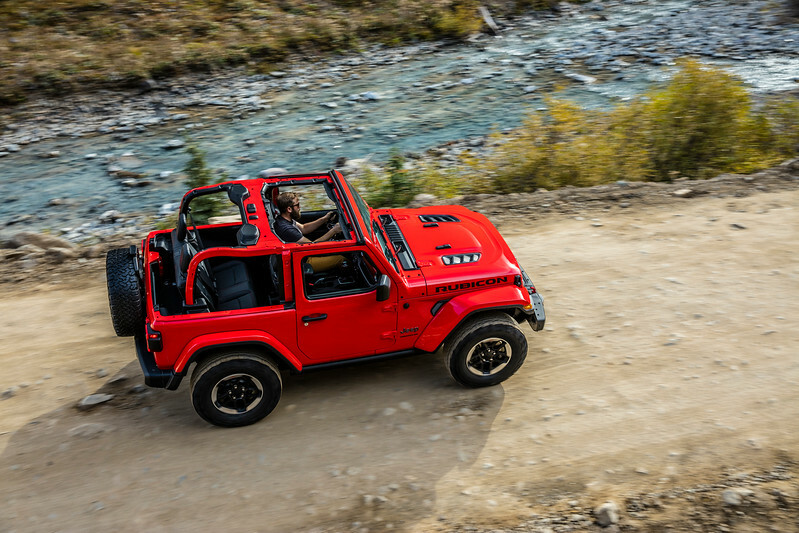 The new Sky One-Touch power top (available in the second quarter of 2018) strengthens Wrangler’s promise of utility and adventure by allowing occupants to retract the full-length open canvas roof with a push of a button. 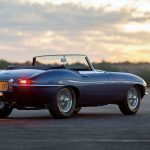 An all-new premium Sunrider soft top provides another easy open-air option and has been improved by adding two additional bows to manage the fabric. This new design helps to quiet wind noise and allows for easier access to partial and full-open top positions. New for 2018, the soft top features retainers that slide into a track for easier rear passenger window removal. 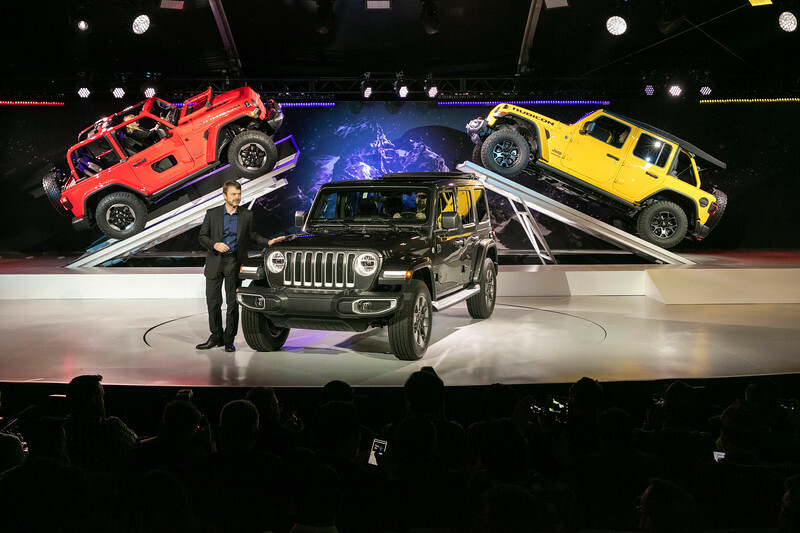 The Jeep design team hasn’t forgotten about Jeep hardtop lovers, and the 2018 Wrangler Sahara and Rubicon models share a body-color hardtop option (black on Sport and Sport S), offering a unique premium appearance. A black three-piece hardtop, available on all models, offers even more options for open-air driving. Lighter Freedom panels and improved latches enable quicker removal and installation of the hardtop. 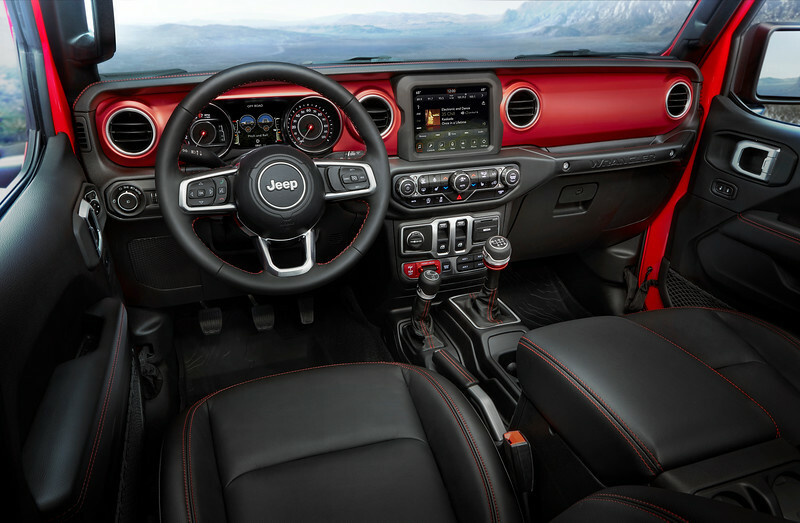 The 2018 Wrangler’s fourth-generation Uconnect systems include Apple CarPlay, Android Auto and choice of 5, 7, or 8.4 inch touchscreens with pinch-and-zoom capability delivering communication, entertainment, and navigation features drivers and passengers desire, including a full-color LED instrument cluster. The new Uconnect systems include easy-to-use features, enhanced processing power, faster startup times, and touchscreens that display high-resolution graphics. The new Jeep Wrangler offers more than 75 available active and passive safety and security features. 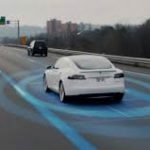 Available features include: Blind-spot Monitoring and Rear Cross Path detection, ParkView rear backup camera with dynamic grid lines, electronic stability control (ESC) with electronic roll mitigation, and four standard air bags. Functional features include climate and volume control knobs, media charging and connectivity ports, and Engine Stop/Start control, all sculpted for quick recognition, within easy reach of the front-seat occupants. The instrument panel on Sahara models include a soft-touch surface with accent stitching. Comfort is provided by cloth or leather contoured seats with accent stitching, which now have adjustable bolsters and lumbar supports. 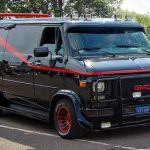 The driver and front passenger vinyl-wrapped door trim panels are soft to the touch, and the arm rests have been lengthened for better comfort. New Lift-Assist handles under each door armrest have an integrated design that makes door removal quicker and easier than ever. Convenience features include passive entry with Keyless Go. Two USB ports up front and two in reach of occupants in the back seat connect to the media center. Standard 12-volt accessory outlets are located throughout the all-new Wrangler and a 115-volt AC outlet is available to power select three-pronged home electronics. Every Wrangler model receives a Trail Rated badge thanks to legendary 4×4 capability that includes skid plates; front and rear tow hooks; all-new front fascia; available front and rear steel heavy-duty off-road winch-ready bumpers with removable end caps; an industry-leading approach angle of 44 degrees, breakover angle of 27.8 degrees, departure angle of 37 degrees and ground clearance of 10.9 inches; up to 30 inches of water fording; and a towing capacity of up to 3,500 pounds. The all-new 2018 Jeep Wrangler delivers legendary off-road capability courtesy of two advanced 4×4 systems, and for the first time in Wrangler’s history, the Command-Trac 4×4 system features a two-speed transfer case with full-time four-wheel drive and a 2.72:1 low-range gear ratio that is available on Sport and Sahara models. The new Selec-Trac full-time two-speed transfer case is intuitive and allows the driver to “set it and forget it,” while constantly sending power to the front and rear wheels. Command-Trac and Rock-Trac systems offer full-time torque management, enabling optimal grip in low-traction conditions. The fine folks over at the Wrangler Forum provided pricing information based on an internal Wrangler info sheet provided by FCA to Jeep representatives at the LA Auto Show. The low end four-door Sport and Sport S have a MSRP of $29,995 and $33,195, respectively; the top trim two-door Rubicon starts at $36,395 and the Rubicon Unlimited at $40,195. These prices represent an increase of between $2,100 and $2,750 across the lineup. With the new look and all of the new features, the 2018 Jeep Wrangler is a winner.